Those of you who saw the Cheap And Tiny entry on cheap small form desktops probably had a clue that I posted it because I was looking for, well, cheap small form desktops, since my iBook is getting on in years, but I want to wait for the Intel Macs before I get another Apple PC. I was all set to order a refurbished Asus AE3 Pundit barebone kit with a Sempron 2800+, along with an old salvaged HDD and a stick of RAM, but then I found an almost fully equipped IBM Intellistation E Pro P4-1600 (that would be a 1.6GHz Pentium 4) for a low $170 (after rebate) on Tiger Direct, and I decided on that instead. I really, really wish I had read a bit more on Tiger Direct before going through them. 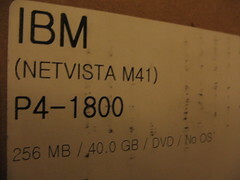 Yes, they sent me an IBM Netvista M41 P4-1800 instead. Actually, when you order a P4-1.6 and your mistaken order is a P4-1.8, that’s not too bad, eh? 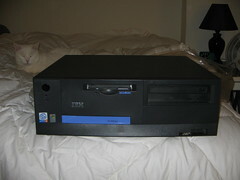 But I was ordering as small form a box as I could get for cheap, and this Netvista M41 is definitely not small. So I looked at the rather draconian return policy, looked at this BIG HONKING IBM NETVISTA M41, made a decision … and filled out and mailed the rebate forms and set up the box on my desk. Hey, it’s not what I ordered and it’s not small, but it’s still 0.2GHz faster than what I expected. I can live with that. I ordered a WinXP OEM CD and a 1GB stick of RAM for it, but I did it on NewEgg. No more Tiger Direct for me. But I hope that rebate comes at the end of 14 weeks anyway. So here’s my new desk layout. And if anyone asks, it was a typographical and photographical error on Tiger Direct’s part, after all, and they’re not responsible. I wish I had come across those links before, too. Back in April I ordered a PC bundle from TD, and 5 months later it still was not running correctly and I was totally irate at their ineptitude. I too finally found the correct and working parts at NewEgg. As for typographical errors, they had one which they could not hide or redirect the blame. One of the returns I had was sent to the wrong address due to a typo on their part. And it took them months to get to the bottom of it, yet I figured out the problem with one call to UPS. Good luck with the new equipment. TD used to be much better years ago (like, 8?). From what I have heard, they are not a good company to deal with anymore. Think of it this way: at least you got something, and it was pretty close! I don’t know, but I figure there are people out there who like to run a large variety of software. I’m surprised you have the monitors up that high. I like to get them as close to desktop surface as possible…retracting the LCD stand to totally closed. Hurts my neck otherwise. 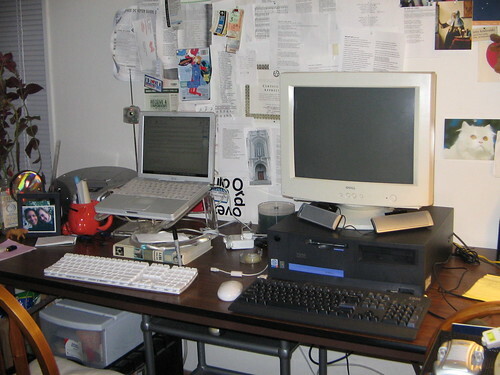 I’d have that Netvista standing up on its side, if it was mine (and for the record, I would have kept it anyway too). I need the monitor high for my back, otherwise I tend to look downwards and slouch too much, which is bad for my posture. I always try to keep the middle top third of the screen at around eye level. Josh – the Mactels are coming, the Mactels are coming! What, no Linux? Or at least dual boot or maybe win4lin pro to run Windoze on top of Linux. Anyway, TD has merged with Global Computer. I actually do a fair amount of buisness with them (actually Global). I have purchased several Systemax computers from Global for our company desktop machines and I have been very happy with them. But I have a sales rep that I work with and have been working with for a long time. He takes care of me.